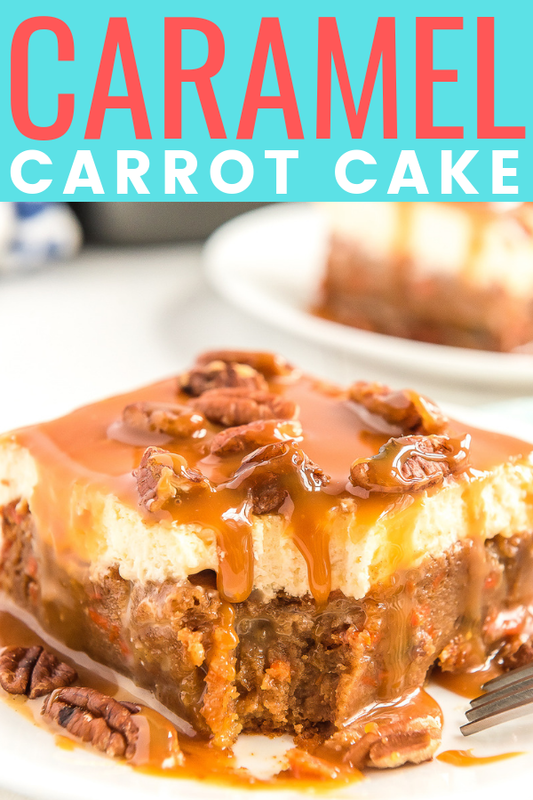 This Caramel Carrot Cake Poke Cake is so sweet and delicious, you’ll never want any other carrot cake again! 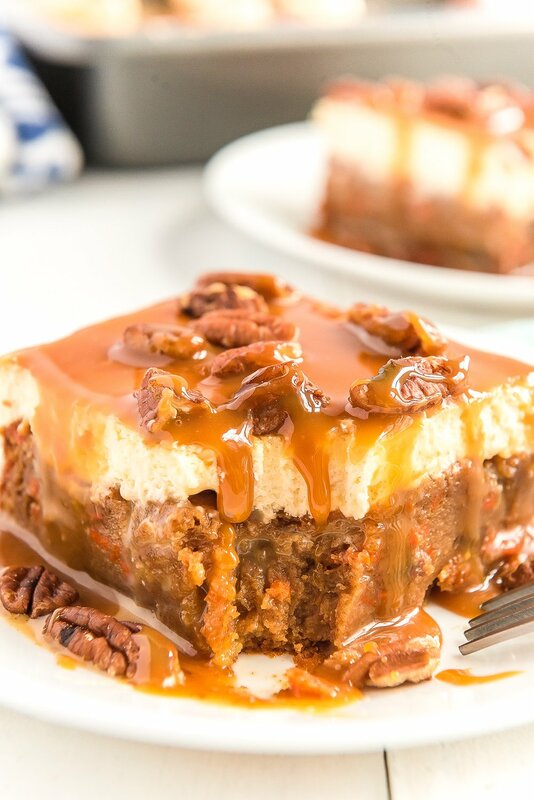 Baked to perfection and saturated in sweetened condensed milk, then topped with fluffy frosting and drenched in caramel sauce. I hope everyone had a wonderful Easter or at least a great day with their families! 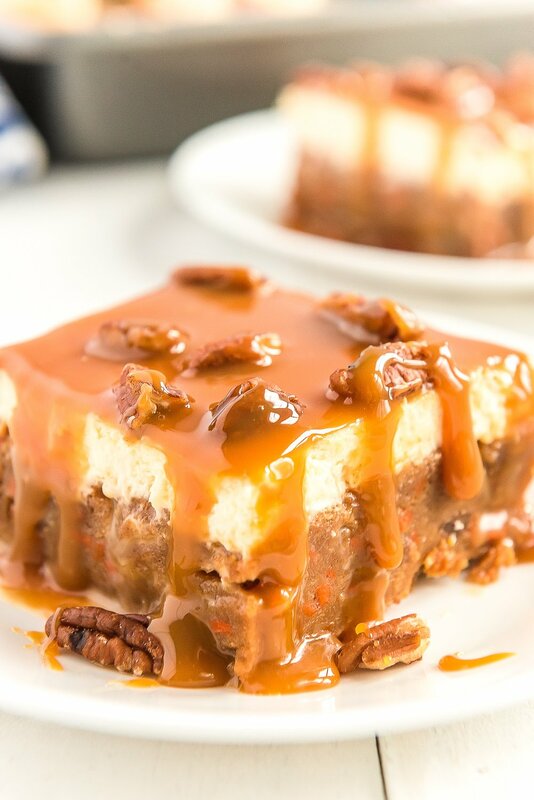 I know most associate Carrot Cake with Easter, but I think it’s a great dessert that can be served all year round! This particular Carrot Cake is a Poke Cake which means it’s had holes poked in it and then drenched in Sweetened Condensed Milk. Then it’s topped with frosting and in this case Sea Salt Caramel Sauce and some chopped pecans. I had never made or had a Poke Cake before this one and now I understand why they are so popular! They’re incredibly moist and delicious and let’s just try to forget about the fact that they’re pretty much waistline suicide. Seriously, don’t even look at the calorie count. But honestly, when something tastes this good, who cares if you have to buy new pants, amirite? Summer is still a couple of months away anyway. But seriously, though, you’re going to love this cake! This carrot cake recipe is made from an adapted cake box mix. However, you can definitely use your favorite from-scratch recipe and use the frosting and toppings and the end result will be very similar. This carrot cake is anything but basic. It’s topped with a delicious whipped frosting make with cheesecake pudding mix which stands in for traditional cream cheese frosting. 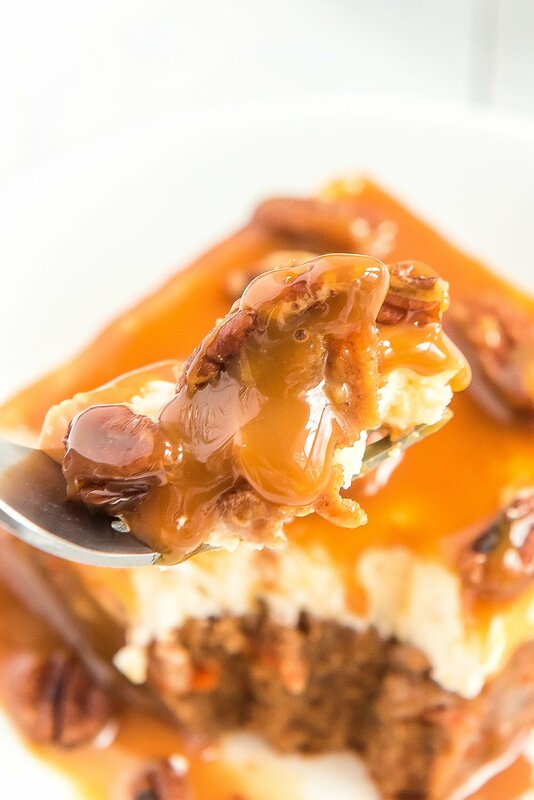 Then the salted caramel sauce is just over the top, once you top it with pecans, it’s game over (for your diets, that is). The Sea Salt Caramel Sauce was the perfect topping for this cake, the combination of sweet and salty was so delicious. I loved the way everything came together and the slight crunch of the pecans was great for the texture of the cake. Everyone loves this cake and always has seconds! Begin with a cake mix, it can be your favorite brand, I like Duncan Hines. You can also make your favorite from scratch carrot cake instead. 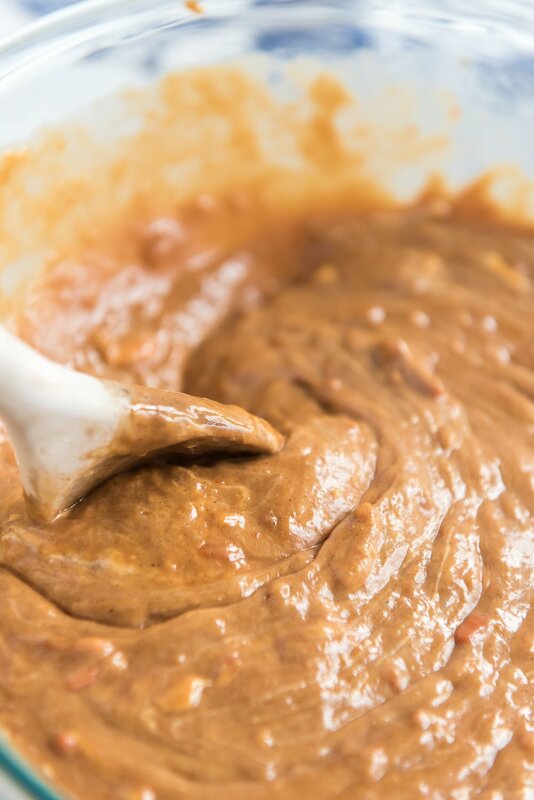 Mix all of the cake ingredients EXCEPT for the sweetened condensed milk together in a large bowl with a hand mixer or stand mixer fitted with a whisk attachment. 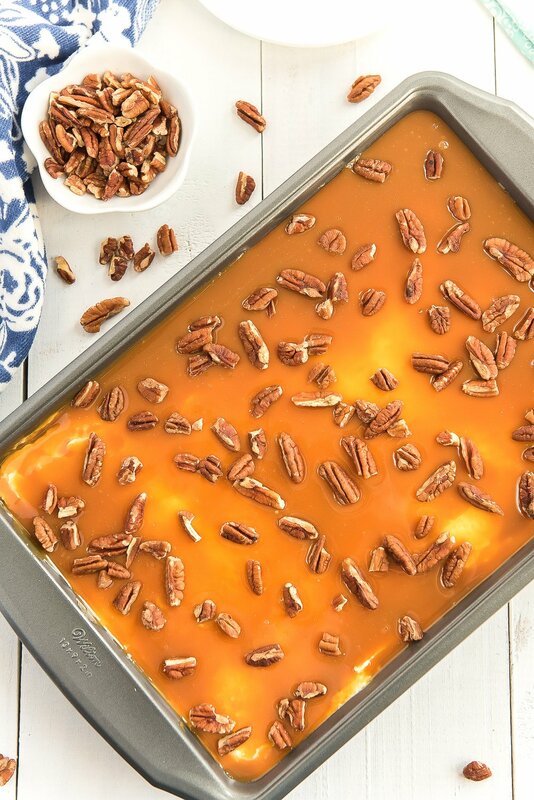 Pour the batter into a prepared 9×13-inch baking pan and bake. 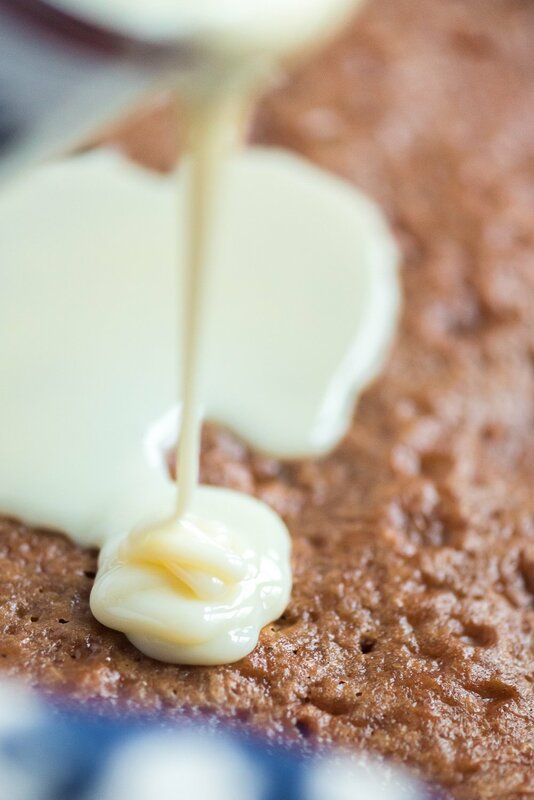 Once baked, poke holes all over the cake and then pour the sweetened condensed milk all over the top of the cake. You can do this while the cake is hot or cold, but let it soak in and cool completely before frosting. Prepared the frosting and frost the cake. 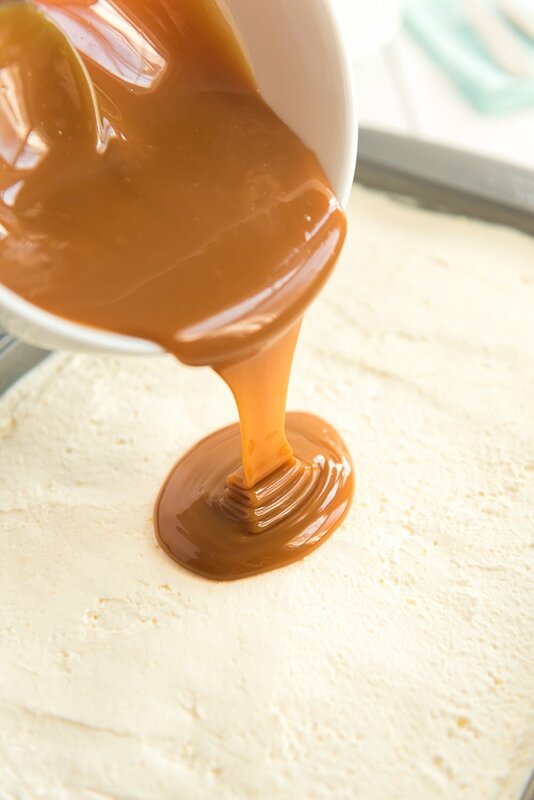 Pour the caramel sauce over the top of the cake. I like to do this right before serving if possible. Sprinkle chopped pecans all over the top of the cake. Slice and enjoy! This post was originally published in April 2014 and was updated in March 2019 with new photos, video, and recipe clarifications. Preheat the oven to 350 degrees F and grease a 9x13-inch baking pan with cooking spray and set aside. Combine cake ingredients except for sweetened condensed milk and mix until combined. Pour batter into the prepared pan. Bake for 40 to 45 minutes. Let the cake cool completely in the pan. Once the cake has cooled, use a skewer to poke holes all over the cake. Pour the sweetened condensed milk over the top of the cake and let sit for at least 1 hour up to overnight. 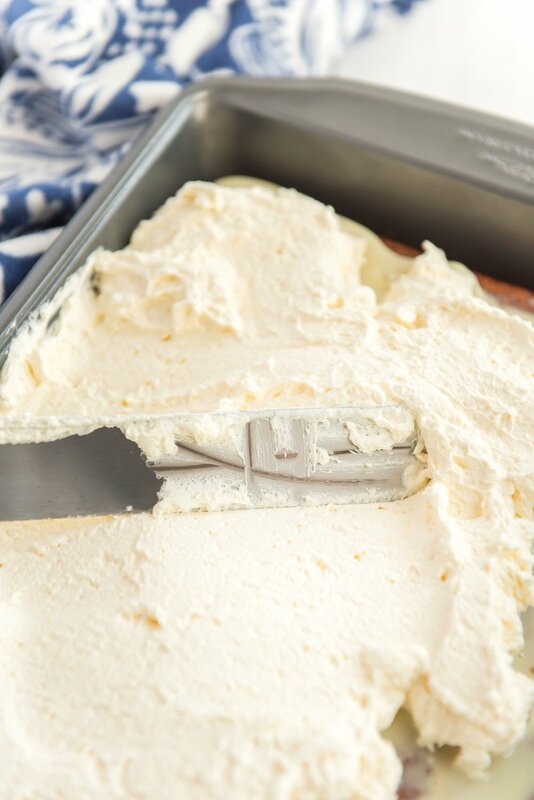 Once the cake has set, whip together the frosting ingredients until light and fluffy in a large bowl with a hand mixer or in a stand mixer fitted with a whisk attachment, evenly spread the frosting over the cake. 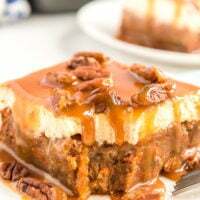 Pour the Caramel Sauce over the frosting and top it with chopped pecans. Slice and serve. Store leftover cake covered in plastic wrap or aluminum foil in the fridge for up to 2 days. 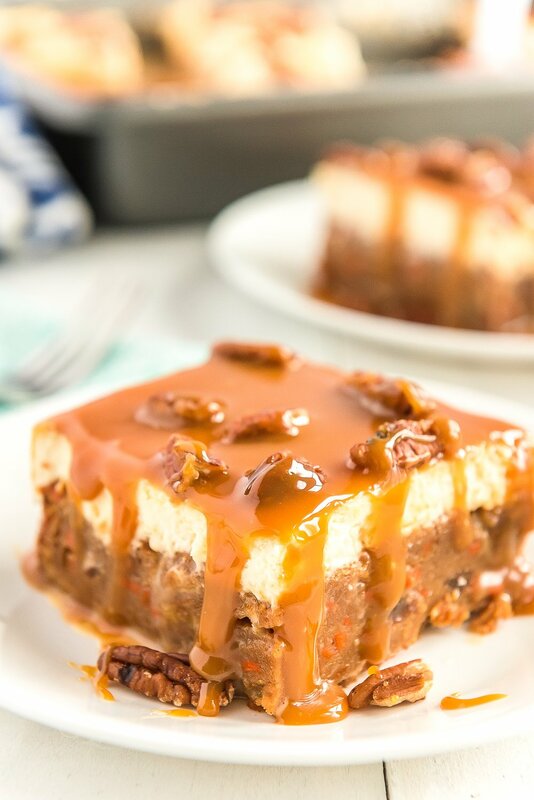 This cake is best when frosted the day of serving but you can prep the cake through Step 4 and add the frosting and caramel just before serving to save time.